About China China, (People's Republic of China), is situated in eastern Asia, bounded by the pacific in the east. The third largest country in the world, next to Canada and world's land mass There are 6,536 islands larger than 500 square meters, the largest is Taiwan, with a total area of about 36,000 square kilometers, and the second, Hainan. The South China Sea Islands are the southernmost island group of China. 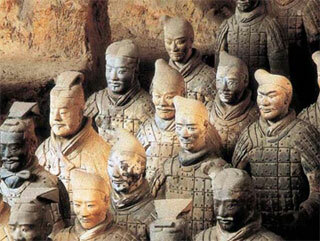 History world, has a written history of 4,000 years and boasts rich cultural relics and historical sites. It is the inventor The Great Wall, Grand Canal and Karez irrigation system are three great ancient engineering projects built 2,000 years ago. Now they are the symbols of the rich culture of the Chinese nation. China has gone over a long history of primitive society, slavery society, feudal society and semi-feudal semi-colonial society and the present socialist society. Climate China can be visited through out the year because of the stretch of its territories and sites and activities it can offer. Deciding when to visit China depends on which places you wish to visit, what type of weather you enjoy, and how much a bargain you want. 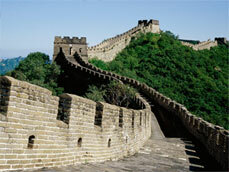 China is a huge country with many different climates and types of landscape. Think of it in terms of the United States, which China resembles in size and shape. Traveling along the Golden Route (Beijing, Xian, Shanghai, Guilin) is like visiting New York, Chicago, Santa Fe, and Jacksonville, Florida all in one trip. April, May, September and October are the peak tourist months at China’s most popular destinations when the weather is most comfortable. Prices drop a bit in the shoulder season, which runs from November through March and from June through August. However, the winter months are peak season for trips to China’s Hainan Island and to the Northeast Harbin for its world-famous ice-lantern festival. This months are also packed with New Year holidays, Chinese Spring Festival and other national or local happy fairs. Summer months are great time to explore China’s Far East-Manchuria. Spring 0-22°C, Western suits, jackets, sports coats, woolen jackets, long sleeve shirts and travel shoes. Summer 22°C and above, T-shirts, short sleeve shirts, skirts, sandals, caps, rain wear. Autumn 10-22°C, Western suits, jackets, sports coats, light woolen sweaters, rain wear and travel shoes. Winter 10°C or lower, overcoat, cotton clothes, lined coats. In very cold areas a cap, gloves and cotton-padded shoes are required.